What is STREAM? STREAM Education couples academic concepts with real life application in the disciplines of Science Technology Religion Engineering the-Arts and Mathematics. Students become involved in hands-on projects where problem solving, collaboration, and the results of their efforts reflect back upon their lessons. Increased technology to enhance learning is emphasized. Career connections as well as exposure to working professionals further relates students to their own learning as well as their futures. In August of 2018St. Joseph Regional School was awarded another grant from the Diocese of Buffalo Foundation to fund technology in support of our school's STREAM program. We are blessed by this additional support for our students: the Scientists, Technologists, Religious, Engineers, Artists and Mathematicians of the future! ​STREAM teaching is simply the idea of deliberate subject integration. Classroom teachers develop integrations between subjects while continuing to teach to their established curriculum. Specials teachers also develop targeted curriculum that parallels what is being taught in the classrooms. For example, when Grade 8 is studying the “Roaring 1920s” in Social Studies, Music may, at the same time, explore the musical trends of the same period. STREAM Academy is the adding of supplemental, project-based courses to the curriculum. One day a week, during the final period at the end of the day, the entire school (Pre-K-8) is participating in various grade-appropriate STREAM courses from robotics to future-city-competition. We are thankful for the honor of having been chosen to be a STREAM school. We are excited about the opportunities the STREAM initiative offers our students. The future is bright for Catholic Schools. Have you seen this? 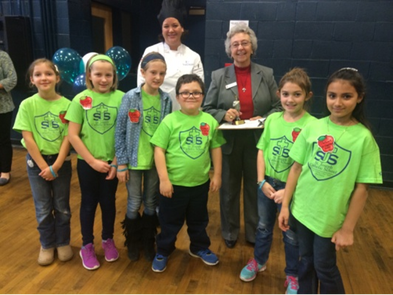 Students with Sr. Carol Cimino (Superintendent of the Diocese of Buffalo) with their Runner-Up Trophy at the "XSTREAM Games and Expo"